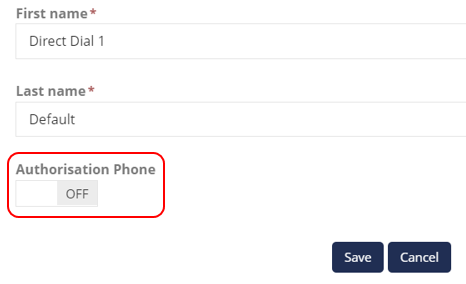 Authorisation Code Dialling allows you to nominate phones which can only place outbound calls once a unique code has been entered. This is most useful when placing phones in communal areas. If you would like this feature enabled please contact essensys staff. To set up a phone to require an Authorisation Code, the handset must be logged into an extension which has Authorisation Code Dialling configured. When this extension is logged in to a handset, any outbound calls will require an Authorisation Code. Any extension can be set up with Authorisation Code Dialling through Telephone Manager. To configure the extension, select the relevant client in the Clients page and click Telephone Manager. Select an extension and click Edit. Here you will find a toggle at the bottom of the page under Authorisation Phone, which can be set to On. Click Save to commit the change. To use Authorisation Code Dialling, users will need to enter an authorisation code, unique to each client. This code is generated for all users within a site when this feature is enabled by the essensys team. The Authorisation Code can be found by selecting a client in the Client page and navigating to Telephone Manager. In the Features Setup menu, select Authorisation to view the client's code. When client users pick up a phone that has been assigned Authorisation Code Dialling, they will be prompted to enter this code before they can make calls. The easiest way to manage a phone for communal use is to keep the designated handset logged in to the extension with Authorisation Code Dialling configured. Users will not need to log in to the phone – just pick it up and enter their Authorisation Code to make a call. Calls charges for calls made using authorisation codes will appear on the customer's bill.